02-Oct-2004 -- Since 1st October is the Nigerian Independence Day, we took the chance of the long weekend visiting the northern part of the country: the edge of the Sahel (the fringe of the Sahara). While checking the roadmap, it appeared that we would be close to a confluence point and there was no doubt that we would take the time to visit it. We took off Friday morning in Abuja in heavy rain going to Kano, passing Kaduna and Zaria on the A2. After Zaria our driver was quite busy swerving many potholes but he managed it well. We made it to Kano and our accommodation at Dantata Life Camp early in the afternoon. Thank you, guys, for your hospitality. There was time left for our first short sightseeing-tour with our guide Yusuf. Kano is one of the oldest West African Muslim cities, surrounded by a now disintegrated mud wall, pierced by thirteen gates which remained intact. The main gate, the Kofar Mata Gate, leads to the Emir's palace and the Central Mosque. We started with the Kofar Mata indigo-dye pits, supposedly Africa's oldest and still operational ones, but the traditional dyeing seemed to be kept alive only for the few tourists that make it to this remote place. We continued with the ancient Kurmi Market, a rambling maze of alleyways and stinking lanes full of all kind of commercial activities where we did not take the time to look around for any bargain. We continued to the so-called camel market and strolling around there a thought popped in my mind like "... how many camels... I have blonde hair, etc.?" Well - I must have been either dehydrated or hungry. Anyway, since it was getting close to sunset, we rushed to the steep hill called Dala, about 366 m high. We climbed the stairs and had a breathtaking view (one or the other was still gasping for air) over Kano. Impressed and hungry we plunged into town for dinner, or should I say, we tried. Since Kano is the city of roundabouts and the given direction "three times straight" is not that easy to follow in these roundabouts, our driver got lost, and not only once. We kept calm and managed this challenge together successfully and arrived at the restaurant we were looking for (I will not tell you where, since I don't find it recommendable). Somehow, we made it back (remember the roundabouts) to Dantata Life Camp and got a good night's rest. Saturday morning after breakfast, we were leaving Kano with our guide Sarki heading towards Daura near the border to Niger on the A2. Our plans were to visit Daura and on the way to Katsina having a stop for the confluence visit. The A2 is a well-kept road and the travel was smooth. 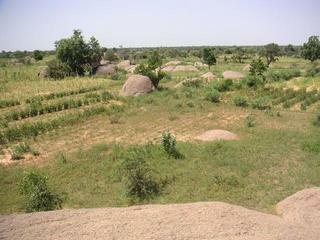 Daura is amongst the seven oldest Haussa city-states, as well as Katsina and Kano. Tradition ascribes the origin of the Haussa population to be based on the marriage of Bayajida or Abuyazidu of Baghdad to the queen of Daura after slaying a giant snake, which occupied the town's only well and terrorised the townspeople. The seven children of this marriage are said to have been the founders of the Haussa states. We visited this legendary well, which still carries cool and fresh water. A small house is built around it now and you need the key-keeper to let you in. Sarki our guide had two bottles filled with the "blessed" water and off we went again. There is not really much more to say about it. Finally, we were on the way to the Confluence now. Roland had managed to find a topo map, showing that we have to get off the road going into the bush, most likely just on a track, a few kilometres ahead of the village Mashi. Luckily, it hadn't rained the past three weeks; otherwise, we would have never made it with the car we came in. The GPS was already set, and at 2.3 km to go I saw the track leaving the street to the right. As expected, Roland did not believe me and we kept on driving towards Mashi. In Mashi we took a turnoff into the bush but the GPS pointed out that it was the wrong way, which led us back to the street. After passing the track again that I had seen before, I was able to convince Roland and our driver to give it a try. And what shall I say? We were closing in on our objective and eventually were less than 300 m away. We left the car behind, Roland was all excited now and walked through fields of groundnuts, millet and "Karkade" (hibiscus) and reached the spot with the "zero-lines" in the middle of one of these fields at around noon. Congratulations! After taking photos and climbing around a bit, we went back to the car and continued our journey.